I haven’t been able to test these, but I wanted to share a little bit about how cool these Lilliputian light boxes can be. I really wish I had test photos from these, but I’m missing crucial components — like the special 16mm film cassettes. I do have some 16mm motion picture film, but as I work to limit my camera collecting it hasn’t made sense to buy expensive components to test cameras I know I won’t use long-term. That doesn’t mean they aren’t cool and worth a mention, though! The Micro 16 was made by the William R. Whittaker Company in Los Angeles, also a manufacturer of aircraft valves, beginning in 1947 and continuing until sometime in the 1950s. It retailed in the late 1940s for about $30 — more than $300 in 2016 dollars. 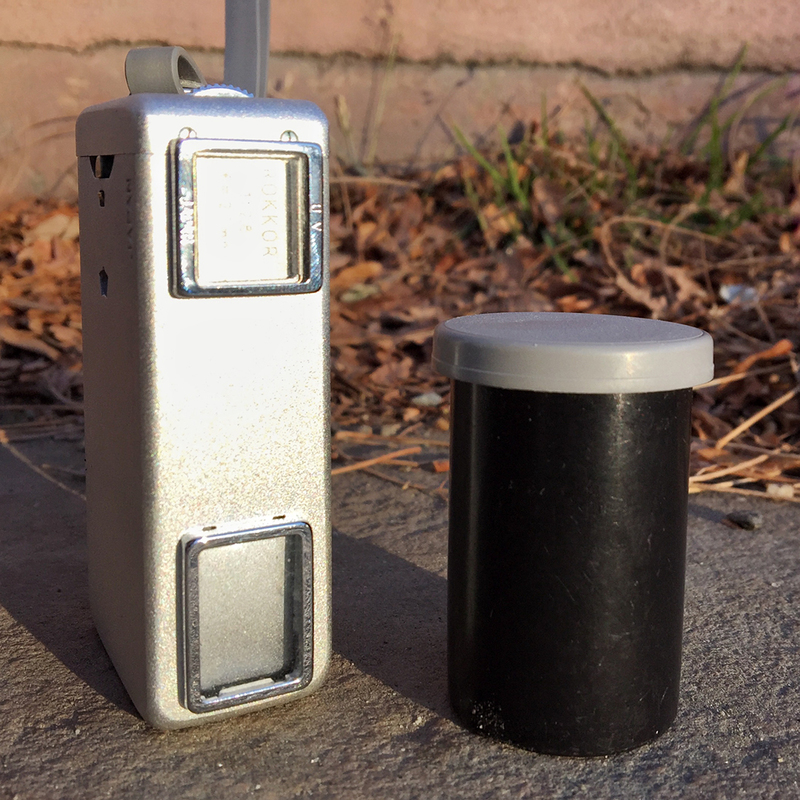 16mm film — common for motion picture cameras and projectors for many years, and the same film that’s inside a 110 cartridge — allowed spy cameras to get this small. 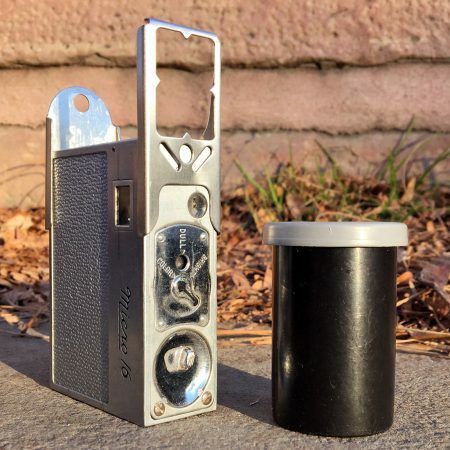 Minox and others also made cameras for even smaller film formats including 8mm, but 16mm cameras were all over from the 1940s to the late 1960s. Whittaker’s subminiatures were considered very well made, though the film advance on the Micro 16 reportedly failed often. The Micro 16 came in a variety of colors and finishes. For its size, it’s surprisingly heavy, as it is machined from a solid billet of aluminum. The film advance plunger pops out from the side of the camera and is locked in place by a gravity pin. Turn the camera with the words “Micro 16” up to disengage the pin and you can pop the plunger out by pushing it in gently; turning the words down and pushing the plunger in will allow the pin to re-engage and lock the plunger closed. The plunger both advances the film and increments the frame count wheel, which you must manually reset (the “start” mark is frame 22, by the way, marked with an arrow) when you load the camera (see manual for details). The frame counter counts up to 24. 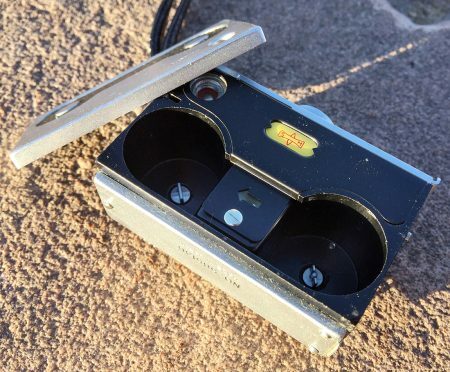 The cassettes are just hollow canisters made of stamped metal with no central spool. The advance plunger simply engages the sprocket holes in the film and scoots it out of one cassette and into the other. Whittaker sold film in 12- or 24-exposure rolls with prepaid developing, which included a reusable mailer for sending a single cassette back to the company for processing. Despite the reputation for a solid build, the Micro 16’s achromatic f/6.3 two-element (doublet) lens was not as highly regarded. An aperture selector on the front offers f/8 (marked “Color”), f/11 (“Dull”) and f/16 (“Bright”), sliding minuscule Waterhouse stops over the tiny lens. Minimum focus distance is listed as 3 feet. Note: Most modern sources report the available apertures as f/6.3, f/8 and f/11, but the aperture numbers listed above are what is printed in the original manuals. It’s possible that these other numbers are accurate, though: the largest opening offers no obstruction and, if it did, the rating of f/6.3 wouldn’t really apply to lens. It’s also true that the first (late 1946 to mid 1947) models were different than later versions in several ways, and the apertures could be among them. I don’t have access to a caliper that could measure an inside diameter of 2.75 or 3.5 millimeters (f/8 and f/6.3, respectively) right now, but by eye I’m inclined to believe the most “open” option is likely closer to f/8 than f/6.3. The shutter release slides in an arc on the right-front of the camera, and the shutter speed is fixed at 1/50 of a second. An optional eye-level finder frame clips onto the Micro 16 for those not satisfied with the nanoscale waist-level finder built into the body. A standard tripod mount is the last of its limited features. 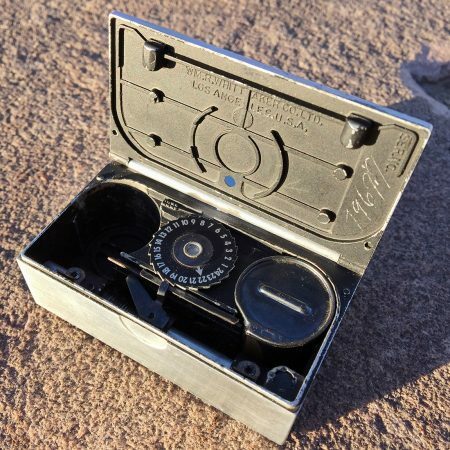 In spite of its limitations, Whittaker presciently made the Micro 16 exactly the right size to fit in an empty cigarette pack and reportedly sold hundreds or thousands of the cameras to detectives, private investigators and police departments on that merit alone. 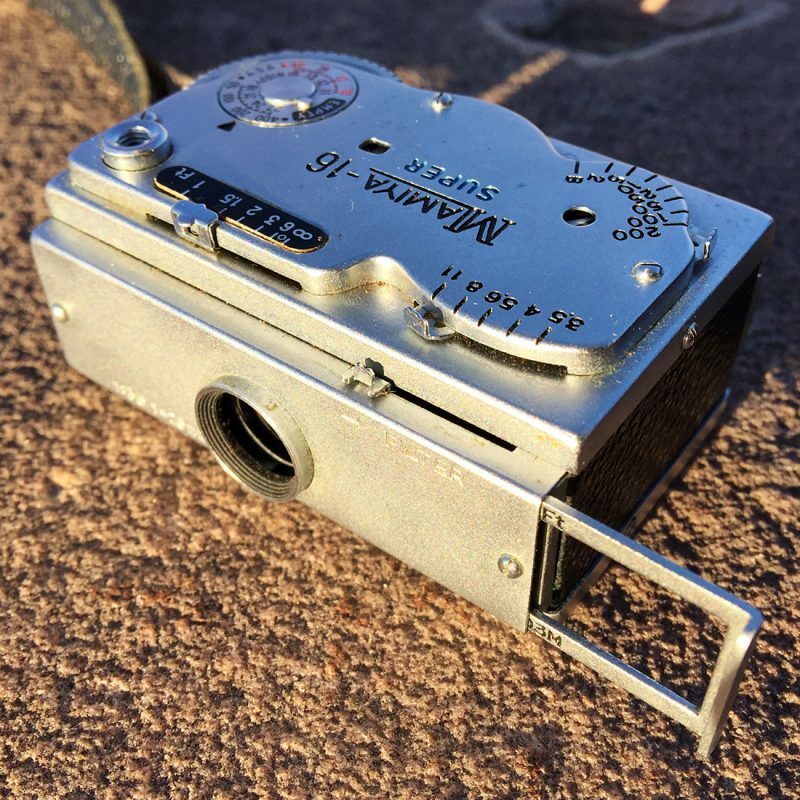 My Whittaker Micro 16 is one of the earliest versions, featuring an aperture selector with a raised arrow (later models had red enamel) and a hand-engraved serial number inside (No. 79699). The first Minolta-16 was released in 1957 and quickly gave way to the improved model II in 1960. Other models came and went between then and 1972, when Minolta discontinued the last of its 16mm cameras, but the model II remained available through all those years. 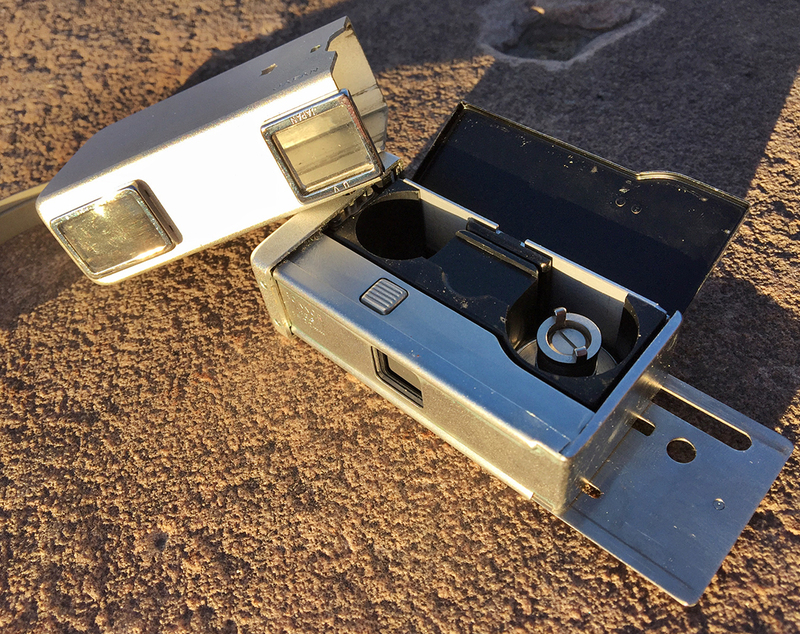 Using a “push-pop” film advance system similar to that of movie-famous Minox spy cameras, the Minolta-16 II was as close as most subminiatures ever got to being a so-called “system camera,” with a long list of accessories available ranging from flashes and development tanks to projectors and enlargers. The Minolta-16 II offers shutter speeds from 1/500 down to 1/30 plus Bulb, and apertures from f/2.8 to f/16 behind its Rokkor 22mm lens. Aperture and shutter speed are controlled by dials on the end of the camera nearest the lens. The shutter release button is on the top of the camera, and both it and the lens are covered by the shell when the camera is closed. When the camera is slid open, the Galilei-type viewfinder can be used, as it is obstructed when the camera is closed. Sliding the camera closed and then open again advances the film and increments the frame counter on the bottom of the camera, if film is loaded. When the shutter is ready, a blue dot appears on the mask in front of the lens. Once the shutter is set, opening and closing the camera does not advance the film until the shutter has fired. Depressing a small brass button on the bottom of the camera releases the shell and affords access to the film. With the cover off, the film door can be opened with a fingernail. Refer to the manual for your model for exact film loading instructions. Focus distance was limited at most apertures and the manual includes a table explaining what the focus depth is at each aperture. Many models can also accept accessory filters, including UV and yellow filters, as well as a “distance” lens which allowed infinity focus at any aperture. At the end of the top cover, above the shutter and aperture dials, is a PC sync socket for attaching a flash. A clip-on cold accessory shoe attachment was available to hold the flash. “My” Minolta-16 is on loan from Denver Post photographer RJ Sangosti; it belonged to his father and is still in its original (although somewhat battered) box along with a number of accessories. The scope of the system Minolta built for their 16mm cameras in the days before Kodak’s 110 format changed subminiature photography forever was expansive and impressive. The first version of the Mamiya-16 was in production from 1951 to 1956, with the Mamiya-16 Super (considered to be “Model II” by many, though not marked as such) replacing it from 1957 to 1959 before the Mamiya-16 Super Model III was released in 1960 (and discontinued the same year). Among the most fully-featured subminiature cameras I’ve come across, the Mamiya-16 Super is packed with options often absent from anything smaller than 35mm, such as a film plane mark. The Super also has a full-featured film reminder dial with markings for color films from ASA 10 to 32, black-and-white films from ASA 50 to 400, and an Empty space. The settings offer a great degree of control, too, with apertures from f/3.5 through f/11 available, and shutter speeds from 1/200 down to 1/2 second, as well as Bulb. The lens has a focal length of 25mm; a little longer than normal for its 10×14 millimeter frame size (a normal lens would be about 18mm). An interchangeable filter holder can be slid over the lens to add a variety of available filters by means of a small lever in front of the aperture selector. The filters, sold as tiny glass discs, could be swapped by means of a small door on the bottom of the front cover: with the filter disengaged from the lens, open the cover and the filter slides out. A focus scale on top is marked from one foot to infinity, and the slide-out eye-level viewfinder has marks allowing parallax correction for middle and very close distances. Film is advanced via a thumbwheel, which also increments the frame counter in the center of the top cover. If film is loaded, successful advancing can be confirmed by means of a rotating disc connected to the take-up spool, visible through a tiny window by the shutter speed selector. The disc is striped so its rotation is quite obvious. The shutter release feels reminiscent of those on larger cameras, and is even threaded for a standard cable release. 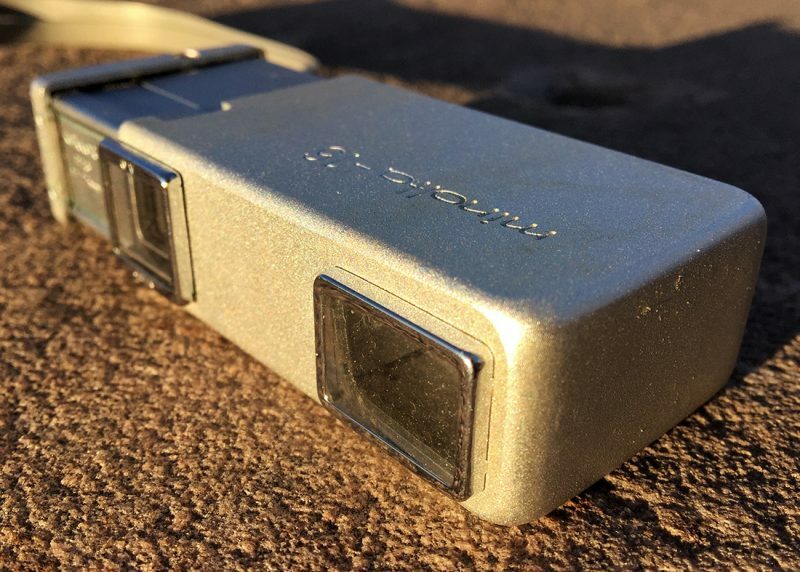 The front standard of the slide-out viewfinder acts as a lens cover when it’s not extended, and the shutter won’t fire with the cover in place. Closing the finder also disengages the filter if it is engaged. 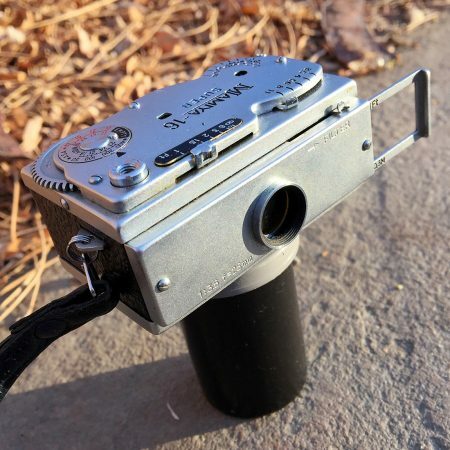 On the bottom of the camera you’ll find a standard tripod socket and, in its center (meaning the two can’t be used at the same time), a proprietary flash connector. 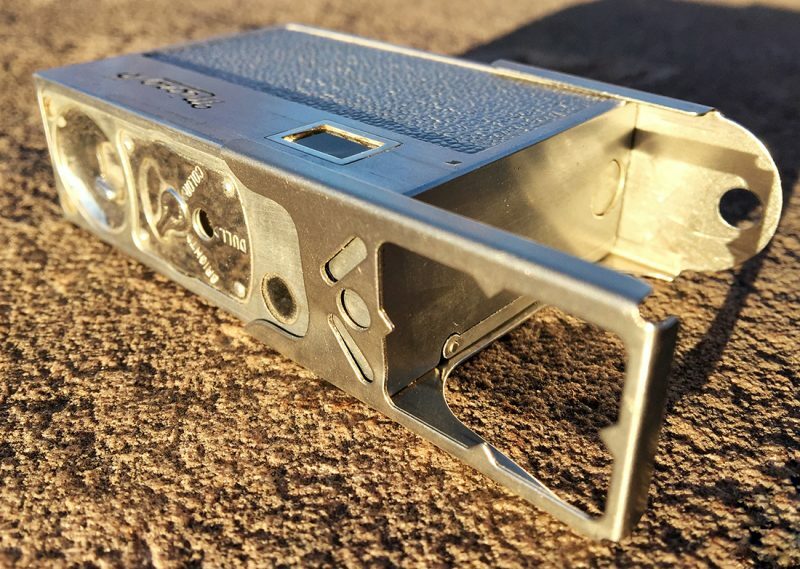 A tiny pin on the end of the camera nearest the single strap lug, when depressed, releases the bottom cover for changing film (see manuals, linked below). My Mamiya-16 Super was a thrift-store score, coming to me in a shoebox with several other cameras. Ultimately it turned out to be the only one in working order, but that’s okay with me because it’s so cool! It definitely seems to be the most versatile of the three subminis presented here, and feels well made and easy to use. Unfortunately, as with the others, I don’t have any film cassettes for it, so I won’t be making an effort to test it. I suspect cassettes could be rather expensive — especially since I can’t find any for sale anywhere! A whole host of other manufacturers got in and out of the subminiature market in the 30 or so years it was viable, and there are a wide variety of unique tiny cameras available around the world for you to try. If you’ve got a cassette I could use to test one of these and you’re interested in trading for some 16mm film, definitely contact me!